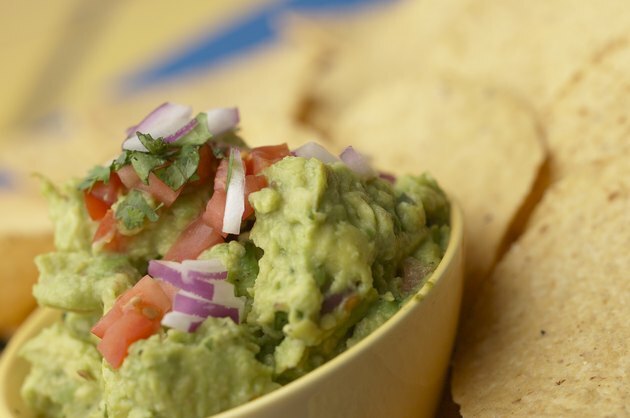 Guacamole is a traditional dip and garnish used in Mexican fare, although it originated in Aztec culture. Peeled, mashed avocados serve as the base for guacamole. It also typically includes diced tomatoes, garlic, lemon or lime juice, onion and tomatoes. Some variants of this dish also include diced cilantro and sea salt or table salt. Although guacamole is relatively high in calories -- avocados, which contain 322 calories each, and make up most of the calorie content -- several nutrients make this dip a healthy option. Vitamin K is an essential vitamin for blood clotting -- it aids in the formation of platelets that help prevent excessive bleeding from wounds. Vitamin K also improves your body's ability to absorb and use calcium, which may help prevent osteoporosis. One avocado contains about 42.2mcg of vitamin K, or about 35 percent of the recommended daily intake for male adults, and about 47 percent for females. This makes guacamole a good source of this vitamin. Guacamole is a rich source of vitamin A -- each avocado contains about 293 IU, or about 10 percent of the recommended daily intake for adults. Vitamin A may help protect you against vision problems, particularly night blindness. It is an antioxidant vitamin that may help prevent cancer and cellular damage caused by free radical molecules. Vitamin A may also boost your immune system, helping your body ward off viral and bacterial infections such as influenza and candida. Lycopene is a component of tomatoes, a staple ingredient of guacamole. Tomatoes contain nutrients, such as vitamin C and folate, which may also reduce cancer and heart disease risk, current research on the benefits of lycopene is inconclusive. Avocados are rich sources of oleic acid, a type of essential fatty acid. Oleic acid may help lower levels of low-density lipoprotein in your bloodstream. LDL carries cholesterol, which may contribute to arterial blockages that may increase your risk of heart attack and stroke. Decreased LDL levels may help your body clear lipids from arterial walls, improving circulation and decreasing your risk of heart disease.